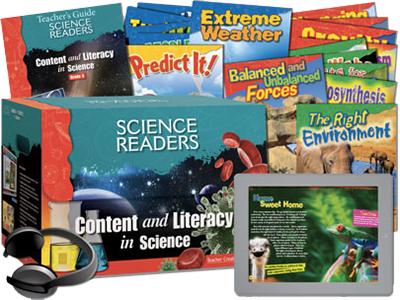 This series helps students simultaneously build literacy skills and science content knowledge with high-interest, appropriately levelled informational text featuring hands-on lab activities. Engage students and build 21st century skills with digital support such as video, audio, and interactive eBooks. Support above-, below-, and on-grade level readers with levelled books and differentiation strategies. Develop critical thinking skills with lab activities, student activity sheets, and a variety of assessments. Minimize prep time by utilizing lessons, assessments, and strategies included in the Teacher's Guide.